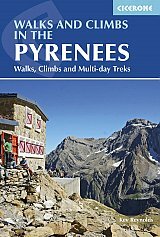 Essential guidebook of walks and climbs in the Pyrenees, with over 170 day walks, multi-day walks, climbing routes and mountaineering ascents. Covers all valleys and peaks on both sides of the border with France and Spain, with through routes and peaks to bag, as an introduction to one of Europe's finest mountain ranges. The active walker, trekker and climber is spoilt for choice. There are exquisite valleys and passes to wander and summits of 3000m and more within the reach of most hill walkers. The landscape is full of diversity and contrast, with Alpine-style peaks, small glaciers, deep gorges and more than a thousand mountain lakes. The range is also known as the 'flower garden of Europe', and the wildlife includes various species rarely seen elsewhere on the continent. Since the first edition appeared in 1978, Walks and Climbs in the Pyrenees has become accepted as the authoritative guide to the range and has been continuously updated and in print. For centuries the Pyrenees were dismissed as holding little of importance to the climber and mountain walkers ignored them almost completely. But all that has changed and the Pyrenees have now become the focus of attention for mountain activists of all degrees of commitment.